The best approach to Venice—Chioggia—A first view—Another water approach—Padua and Fusina—The railway station—A complete transformation—A Venetian guide-book—A city of a dream. I have no doubt whatever that, if the diversion can be arranged, the perfect way for the railway traveller to approach Venice for the first time is from Chioggia, in the afternoon. But to resume—Chioggia is the end of all things. The train stops at the station because there is no future for it; the road to the steamer stops at the pier because otherwise it would run into the water. Standing there, looking north, one sees nothing but the still, land-locked lagoon with red and umber and orange-sailed fishing-boats, and tiny islands here and there. But only ten miles away, due north, is Venice. And a steamer leaves several times a day to take you there, gently and loiteringly, in the Venetian manner, in two hours, with pauses at odd little places en route. And that is the way to enter Venice, because not only do you approach her by sea, as is right, Venice being the bride of the sea not merely by poetical tradition but as a solemn and wonderful fact, but you see her from afar, and gradually more and more is disclosed, and your first near view, sudden and complete as you skirt the island of S. Giorgio Maggiore, has all the most desired ingredients: the Campanile of S. Marco, S. Marco's domes, the Doges' Palace, S. Theodore on one column and the Lion on the other, the Custom House, S. Maria della Salute, the blue Merceria clock, all the business of the Riva, and a gondola under your very prow. That is why one should come to Venice from Chioggia. The other sea approach is from Fusina, at the end of an electric-tram line from Padua. If the Chioggia scheme is too difficult, then the Fusina route should be taken, for it is simplicity itself. All that the traveller has to do is to leave the train at Padua overnight—and he will be very glad to do so, for that last five-hour lap from Milan to Venice is very trying, with all the disentanglement of registered luggage at the end of it before one can get to the hotel—and spend the next morning in exploring Padua's own riches: Giotto's frescoes in the Madonna dell'Arena; Mantegna's in the Eremitani; Donatello's altar in the church of Padua's own sweet Saint Anthony; and so forth; and then in the afternoon take the tram for Fusina. This approach is not so attractive as that from Chioggia, but it is more quiet and fitting than the rush over the viaduct in the train. 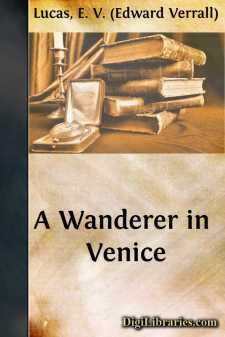 One is behaving with more propriety than that, for one is doing what, until a few poor decades ago of scientific fuss, every visitor travelling to Venice had to do: one is embarked on the most romantic of voyages: one is crossing the sea to its Queen. This way one enters Venice by her mercantile shipping gate, where there are chimneys and factories and a vast system of electric wires. Not that the scene is not beautiful; Venice can no more fail to be beautiful, whatever she does, than a Persian kitten can; yet it does not compare with the Chioggia adventure, which not only is perfect visually, but, though brief, is long enough to create a mood of repose for the anticipatory traveller such as Venice deserves.